Today I received this from a lovely blogger (who I have mentioned before) with whom I share a love of all things crochet. Thank you, Ali for the nomination! Check out her blog here. 1. Thank the blogger who nominated you;2. Answer 10 questions about your favourite things;3. 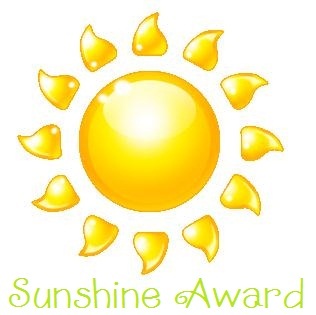 Nominate 10 further blogs to receive the Sunshine Award and let them know they’ve been nominated. 3. Favourite non alcoholic drink: Water, you can do so much with it! 5. My passion: All things crafty (especially sewing, crocheting and embroidery) and being a good wife and Mum. 6. Getting or giving: Giving (unless it’s flowers, I love receiving flowers). 7. Favourite pattern: That’s hard. I love the things that this lady does. 10. Favourite country: I’d love to see more of Italy.